JugoPass is back for 2019, and it’s your ticket to an incredibly tasty deal on Canada’s favorite smoothies. 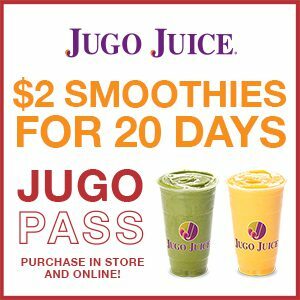 Here’s how it works: 1 – Purchase a JugoPass for only $20 in-store or online at shop.jugojuice.com 2 – Your JugoPass entitles you to buy any Jugo Juice smoothie for only $2 for 20 days in a row, between February 1-20, 2019. 3 – Enjoy your smoothies and the cash you saved!